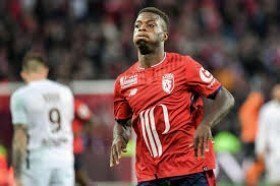 The 23-year-old has enjoyed a sublime 2018/19 season with Lille where he has contributed 12 goals and five assists in the space of 19 league matches. Owing to this form, he has already been linked with Arsenal and Barcelona but it appears that he won't come on the cheap when the transfer window reopens in just over a week's time. Speaking to Telefoot, Campos has acknowledged that the club would accept a sum of around £72m for the Pepe's sale this winter, although any suitor will also have to convince the player, he said: "€80million (£72m), but [any club] will also have to convince the player." Pepe currently has more than three years remaining on his contract with Lille, who are second in the Ligue 1 standings this term. He has regularly featured on the right wing this season, although he is capable of playing upfront.